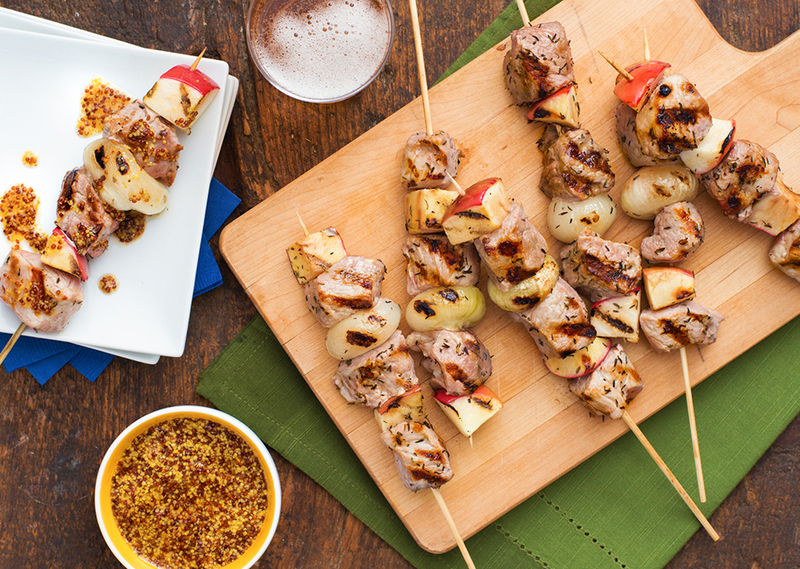 Each skewer is threaded with just three pieces of pork on each skewer for mouth-watering appetizer-size kabobs. Preheat your Evolve grill on Setting 4. In a large bowl, whisk together oil, vinegar, thyme, salt and pepper; toss with pork until coated. Alternately thread pork, apple and onion onto 15 6-inch wooden skewers. Grill, covered and turning as needed, for 15 to 18 minutes or until pork is cooked through. Transfer to a platter. Stir mustard with maple syrup; serve with kabobs for dipping. Tip: Cut white onions into chunks, keeping root intact, to replace cipollini onions if desired.